Mission Statement: “The Pacific Gallery Artists welcomes all levels of practitioners of the fine art photography, 3D artists, digital painting, sculpture, drawing, clay mediums and mixed media, as well as art enthusiasts. 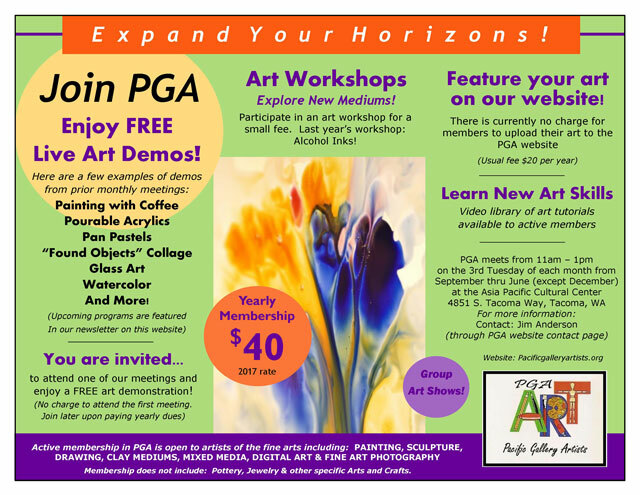 Pacific Gallery Artists meet the third Tuesday of each month from 11am to 1pm (except for June and July). Meetings are held at the Asia Pacific Cultural Center 4851 South Tacoma Way. We have an art presentation and or demo during the meeting time. The PGA annual Christmas party/potluck is held in lieu of the December meeting. Questions/Answers/Help, any of the above folks will be more than willing to do so. Concerns, ideas or applauding! Let these members know.